I’ve mentioned a few times that I think that my jaw fracture resulted in permanent nerve damage on the left side of my face. For the most part, I notice this as a sort of tingly numbness when I touch the left side of my face with my finger. A friend of mine who is a medical student confirmed to me that most people with nerve damage report a tingling feeling in the area. 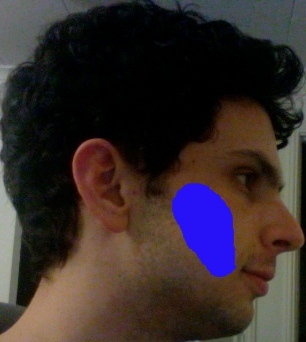 I’ve mapped out the approximate region where the tingling occurs in the following photograph of the left side of my face. As you might guess, the tingly region is the big blue spot. In some places, it’s a more intense tingling feeling than others, but I decided that it would be too hard to color code the region by the intensity of the feeling.